The Video Assistant Referee (VAR) has made headlines for controversial moments at the World Cup but what really should be a focus is the blatant simulation taking place in almost every game. Unfortunately, it’s the reason Australians have never fully embraced the world game and it’s hard for football fans to justify why it happens and in such embarrassing fashion. Football is not alone in staging for free kicks and penalties. The AFL and NRL has been under the microscope for players putting a bit of mayo on to get a favourable call. The thing is though that AFL and NRL fans condemn even the slightest inclination of staging or simulation. Just ask Richmond’s Alex Rance on the backlash he’s received. Some of Rance’s apparent staging has absolutely nothing on what we’ve witnessed in the first week of the World Cup. France had a good crack at it against the Socceroos and Luis Suarez went down like he was shot at the end of Uruguay’s first group match. Brazil’s Neymar is another serial flop offender. 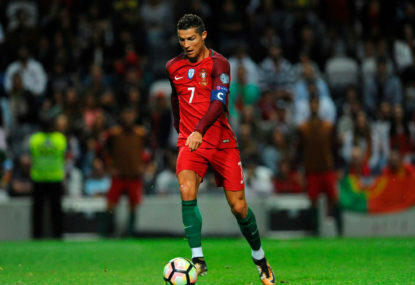 Then there’s Portugal’s Cristiano Ronaldo who demanded that the referee go to the VAR for a penalty against Morocco. Replays showed he was tackled by the air and commentator Martin Tyler couldn’t hide his disgust at the tournament’s leading goalscorer. His teammate Pepe then produced the worst simulation of the tournament so far after a tap on the back by a Morocco player. The way he fell down was the most embarrassing moment of the World Cup and yet his actions went unpunished. You can understand why referees are reluctant to give yellow cards for simulation for fear of getting it wrong, but something needs to be done. Surely, the VAR can have a word in the referee’s ear after a moment of simulation and tell the official to give said player a warning? If it happens again in the match then a yellow card must be issued. The other option is to have a review into these instances after the matches and suspend serial offenders. The rest of the on-field action has been fantastic but these simulation acts need to be stamped out of the game. It’s been going on for far too long. We all remember Rivaldo’s effort in the 2002 World Cup. That moment right then was when FIFA should have acted. Instead, simulation has been allowed to fester. The other aspect I find interesting is that few players and coaches call out other teams for diving. It’s become so insidious that it’s just something that football puts up with. The worst part is that kids are watching their heroes carry on like this and copying it in junior football. If Ronaldo and Neymar do it then of course, the next generation will believe it’s the way to play the game. Thanks to the VAR, technically diving won’t decide a penalty at this tournament but it could still decide a game if the ref gives a free kick outside the box for mistaking simulation for a foul. Maybe a moment like this needs to happen for FIFA to act.